Kumihimo Braiding with beads: Love basic Kumihimo? Bring your technique to the next level by adding beads. In this class, students will learn how to add beads to their Kumihimo braid using S-LON beading cord and size 8 seed beads. Finish with end caps and a clasp of your choice. 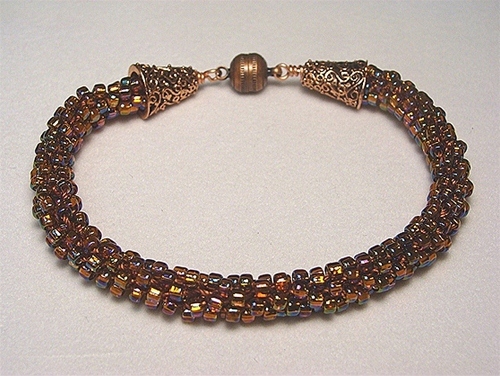 Once you get this basic bracelet done you can incorporate many different types of beads into future projects. You will need to select your materials prior to the day of class. Students must arrive at class with their strands pre-loaded with beads; class time does not include stringing.